I love when my Grove Collaborative comes in the mail. If you have never heard of Grove, you can use my link and get a FREE 5 piece gift set with your first $20 purchase. It is amazing. They sell mostly natural products, some I have never even heard of! 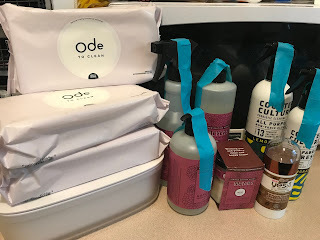 This month, i wanted to try some new items as well as stock up on some old! I of course always like to stock up on my Mrs. Myers! This 4 piece fall Mum set is only $19, which is a great deal. I also love the Mum scent! I was looking to find something new for my countertops and my bathroom. Counter Culture is a brand I have never heard of before, but I cant wait to try it. I got to the Probiotic all purpose cleaner and the fabric refresh set. I was also looking for a quick wipe that wasn't clorox for my kitchen counter (yes when we are sick I do use clorox) but I found this Ode to Clean wipes and container! I will update on how this is when I use it! Usually if you spend over a certain amount you get a free product. This month I received the Yes to 2 in 1 Scrub and Cleanser Stick. I am looking forward to trying this! I absolutely love Grove! Do you?